I feel like I’ve been living in a dream these past few days. 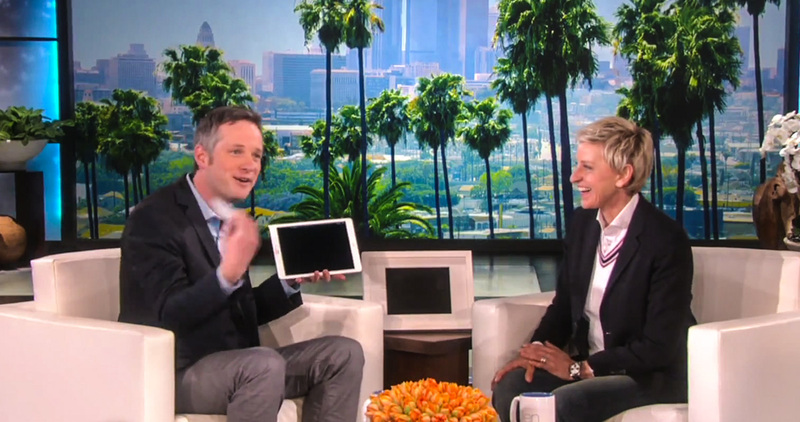 After weeks of anticipation, it was time for me to perform my iPad magic on The Ellen DeGeneres Show at the massive Warner Bros. studio complex in Hollywood. Ellen treats her guests in grand style. After a luxurious night at the historic Hotel Roosevelt — located across the street from the Dolby Theater where the Oscars ceremony will be held next Sunday (Feb. 22) — Ellen’s car service picked us up to take us to her studio. We were on our way to my first appearance on The Ellen DeGeneres Show, and I was so excited I could hardly sit still. The audience started filing in as I waited in my assigned dressing room. Ellen is all about dancing, and this funny concept pumps up the audience to a fever pitch. Frankly, it seems to make them just plain nuts. Trying to follow along with the dancing, I reminded myself that there was a good reason why I became a magician instead of a dancer. That highly effective warm-up routine turned this into the most energetic and boisterous crowd I’ve ever played for. They were in a frenzy, and that energy level would soon spill over into my performance. After what seemed like a week-long wait in my dressing room, it was time for me to walk out onto the enormous Ellen set. As I waited in the wings, I saw another guest on Ellen’s show, Neil Patrick Harris. As I mentioned in my previous post, it was surreal standing between the two hosts from the billion-viewer Oscars broadcast from the past year and this year. As Neil figuratively passed the baton to me, it was my turn to take the stage. “When I saw what our next guest could do with an iPad, I was blown away. Please welcome, all the way from Germany, magician Simon Pierro,” Ellen said. I trotted out and suddenly, there she was! I was hugging Ellen DeGeneres, and she was so kind and friendly, she immediately made me feel welcome. She calls the main guest area where those two white chairs are located “Home Base,” and it’s aptly named because guests on her show all feel right at home with Ellen. After showing Ellen some of my best tricks, it was time to show off my newest illusion: an iPad selfie. As I stood in front of this enthusiastic audience, I commented on how lovely they all were and then asked if anyone would like to be in a selfie with me, in honor of Ellen, whom I called “the Queen of Selfies.” The audience screamed even louder than before as I chose two audience members and snapped a quick picture of them and me together. When I ran back to the stage, I asked the audience to give me a count of three, and on 3, I flung the electronic selfie pic into what looked like a digital picture frame next to Ellen on the set. But that wasn’t a digital picture frame at all — I grabbed a physical photo of that selfie out of the frame, which surprised Ellen so much, all she could say was “WOW!” Next, Ellen ran into the audience with the photo and autographed it for those delighted and astonished audience members. Ellen’s staff was so friendly and accommodating, and we had a wonderful time working with all of them, and especially Ellen herself. What a charmer! Simon, you are a genius. Congrats! You are AMAZING! I’m sure that’s been said before. However after reading your review, I have to compliment you on your excitement of meeting Ellen. She truly is the most outstanding women on the planet. I wish we all had the opportunity to meet her. But you now hold the title for the 2nd most outstanding man on the planet, in my record book. (My husband is #1 ) You have talent charisma, and an unbelievable personality. I will continue to follow your rise to stardom, and look forward to your next presentation. You did great! I’m excited to have the opportunity to meet you (and several masters) at FISM2015. I’m an Italian amateur in magic, and I must say that you did an excellent job in combining magic and technology, really great!